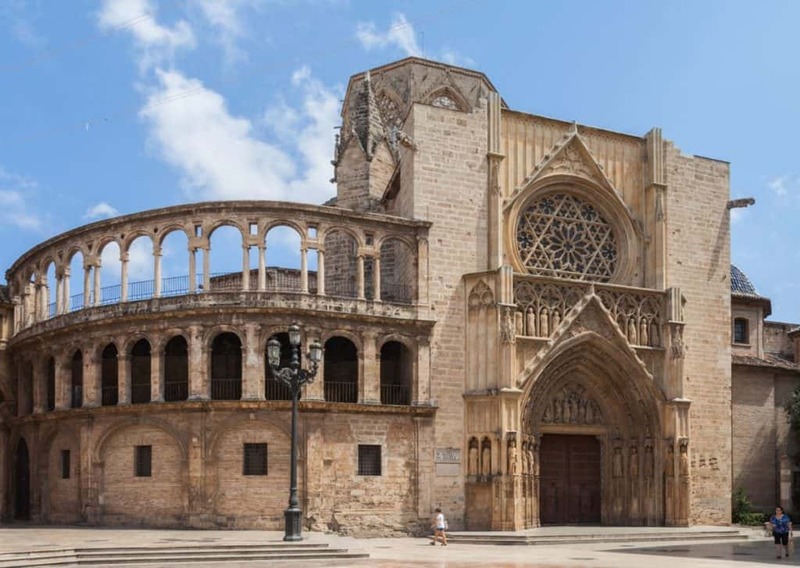 Valencia has many of the things that attracts tourists to Spain, all in one place: The city has a vibrant old centre, with a knot of little streets and splendid medieval buildings like the UNESCO-listed Lonja de la Seda. Valencia is also right on the Mediterranean, so you can laze on broad sandy beaches and tuck into delectable cuisine that draws on the sea. This is the home of paella, surely the most famous Spanish dish of all. There are also ultra-modern visitor attractions at the City of the Arts and Sciences, and it all goes to make Valencua one of Spain’s most complete destinations. It can be difficult to wrap your head around the City of the Arts and Sciences. The attraction is a staggering ensemble of ultra-modern structures that are given an ethereal quality by the reflecting pools that surround them. The whole thing was started in the mid-90s and the finishing touches were made in 2005. Within these gargantuan buildings are cultural venues and first-class family attractions like L’Hemisfèric, a planetarium and IMAX Cinema, or the breathtaking L’Umbracle, a botanical collection of plant species native to Valencia. Book ahead to avoid queues. The star of the City of the Arts and Sciences is this cutting-edge oceanarium that opened in 2003. With 45,000 individual animals from 500 different species, you won’t find another attraction on this scale in Europe. The aquarium is organised by ten zones, each synthesising a distinct environment, and using real seawater pumped from Valencia’s waterfront. So at the Arctic tank you’ll get to see beluga whales swimming in a spacious and thoughtfully designed tank. Elsewhere you can spot sand tiger sharks, penguins, walruses, dolphins and sea lions. It all adds up to a day out adults and little guys won’t soon forget. This majestic late-15th-century building is a UNESCO site and held as the masterpiece of Valencian gothic architecture. La Lonja de la Seda is the finest a monument to Valencia’s golden age, when the city was one of Europe’s main centres for trade and culture. The name means “Silk Exchange”, where traders from far flung pats of the Mediterranean would meet and make deals. Inside you can marvel at the dainty twisting columns of the main hall (sala de contratación) and look up at the incredible detail of the vaulted ceilings. Its tough-looking crenellated outline sits right in front of the city’s central market. The city’s solemn gothic cathedral dates to the 13th and 14th centuries, with renaissance, baroque and neoclassical modifications made over the next few hundred years. Go inside to see 15th-century renaissance paintings by artists such as the Valencian, Jacomart as well as several from Rome commissioned by Pope Alexander VI. But the most fascinating part, and perhaps controversial, is the Chapel of the Holy Chalice. At the altar is one of a few chalices claimed to have been used by Jesus to institute the Holy Eucharist at the last supper. This agate vessel has been dated by archaeologists to between the 4th century BC and 1st century AD, but no scientific analysis as yet been made. The cathedral’s octagonal bell-tower graces many postcards sent home from the city. It’s a Valencian gothic construction begun in 1381 and completed just under 50 years later. Originally it stood completely alone from the cathedral, but extensions in the late-1400s brought the two structures together. If you’re feeling spritely, it’s possible to climb the 207 steps up a slightly precarious stairway to the top for great vistas 50 metres above the city. The big sight at the top is Miguel, the famous bell cast in 1432 and weighing over ten tons. 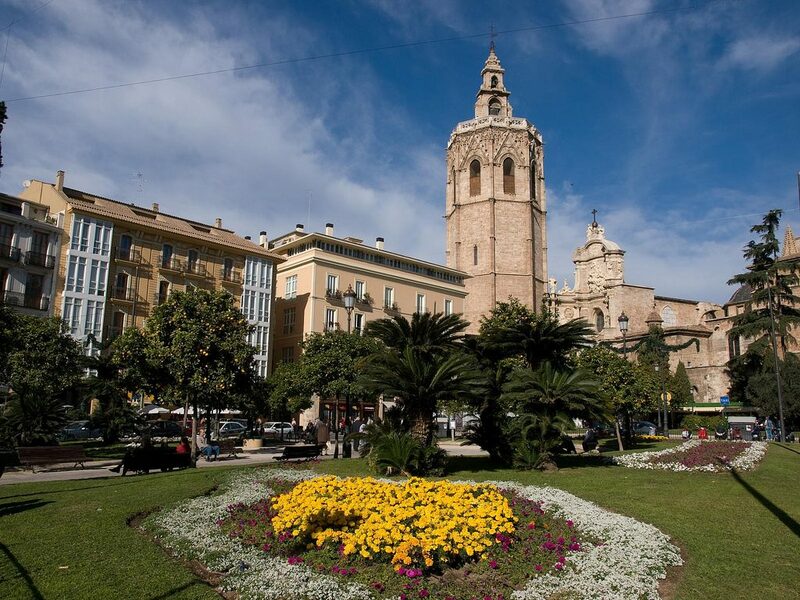 Like most historic centres in Spanish cities the heart of Valencia is made for wandering. All of the must-see sights in this part of the city are just couple of minutes away from each other. Between each landmark is a maze of little streets with cafes, restaurants and local amenities or artisan shops. To beat the heat in summer stop off at a square like Plaza de la Virgen for a cool glass of horchata, a drink made with ground almonds, tigernuts and a variety of grains and flavoured with cinnamon and vanilla. On the southern side of the old-town seek out the Neo-Mudéjar Plaza de Toros (bullring) and the spectacular ticket hall of the Estació del Nord. The northeast side of the old-town is the youngest and most bohemian part of the city. El Carmen took shape in medieval times, situated outside of the 11th-century Moorish walls but within the Christian ones that went up in the 14th-century. What’s great about this place is the way the palaces next to these cool, shaded alleys have been converted into hip boutiques, bars, restaurants and nightclubs. Calle de Caballeros, which begins at Plaza de la Virgen, is where many nights out in Valencia will end up. You can also see fragments of Valencia’s late-medieval defences, at Torres de Quart and Torres de Serranos. This astounding park brings you fresh air and relaxation right in the middle of the city. It came about in the 20th century after the River Turia burst its banks in 1957 causing great damage to the city. The river was diverted and in the 80s its riverbed in the city was turned into nine kilometres of verdant green space. A total of 18 bridges still cross the riverbed, the oldest dating back to the middle ages, and are now just another part of the unusual scenery in the park. Several landscape architects were drafted in to build these gardens, creating a scene of pine forest, orange groves, palms and paths that lead past sports facilities, play areas and fountains. Opposite the Silk Exchange is another prized landmark, the cavernous and palatial Central Market building. Even if you’re just sightseeing here you’ll love the building’s art nouveau metal and glass design. Despite dating to the early-20th century it blends perfectly with the historic architecture in this part of the old city. And if you do feel like doing some shopping at the market you’ll be in foodie heaven. There are 400 small traders at the market, with 959 selling farm and sea-fresh produce at the best prices in the city. If there’s a Spanish delicacy you love, like chorizo, jamón ibérico or manchego cheese, this will be your El Dorado. Within minutes of the old-town you could be sunning yourself on a Mediterranean beach. Malvarrosa is a wide strip of golden sand that stretches for a kilometre along the city’s seafront. The beach has been awarded the Blue Flag for all the amenities it provides, from lifeguard towers , a medical station, drinking fountains and showers, to its easily-navigable ramps and footpaths. The great news is that won’t have to trudge far for a cold drink or bite to eat as there are permanent restaurants right on the promenade next to the beach. Mavarrosa is a fine urban beach, but it might be that you want a more natural setting for you day next to the Mediterranean. In which case El Saler is the way to go: the beach starts some way south of Valencia’s port, which you’ll be able to see in the distance. At 2.6 kilometres in length this beach means peace and privacy as you relax on white sands on the coast of La Albufera Natural Reserve. Behind you will be little more than sand dunes and pine trees and in front moderate waves and a wash that shelves gently into the sea. 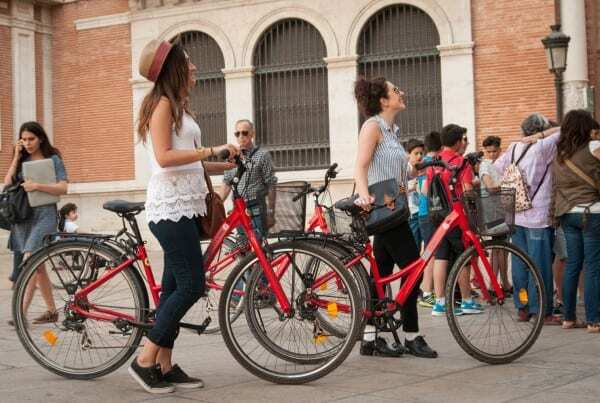 Riding a bike on Spanish roads might seem like a hair-raising experience, but it’s perfectly safe in Valencia’s web of narrow streets, pedestrianised squares, parks and seafront promenades. You’ll have the freedom to zip around Valencia’s top sights, head to the beach or take easy rides through the Jardín del Turia. In 2012 the city implemented the Valenbisi bike sharing network, which is subscription-based and aimed mainly at Valencia’s residents. Still, there are numerous rental companies across the city, ilike PassionBike in Carrer de Serrans. If you want best paella in Valencia, get off the beaten track and go to restaurants frequented by Valencians. There are plenty around Malvarrosa, and if possible it will always pay to make reservations. Paella is probably Spain’s most famous dish, and it was first created right here. Everything that goes into it is local, from the rice grown in vast fields north and south of the city, and even the saffron that flavours the rice. If you’re walking the Jardín del Turia with little ones then make a stop at this imaginative attraction close to the City of the Arts and Sciences. It’s inspired by the classic work, Gulliver’s Travels, written by Jonathan Swift in the 18th century. At the park you’ll feel like a Lilliputian, and kids while have a whale of a time scrambling over the giant figure of Gulliver prone on the ground. There are slides, ramps, stairways and all kinds of little interactive features. Also part of the attraction is a skating area, giant chessboard and a mini-golf course. This celebrations that take place in Valencia in the build up to St. Joseph’s Day on the 19th of March could be the noisiest and most colourful of any fiesta in Spain. Las Fallas marks the beginning of spring, and in the past the city’s carpenters would hold bonfires on the night before the 19th in honour of their patron saint. Slowly it developed into the awesome spectacle you can see today, with something special to see every day. For example every day at two in the town square you can see the La Mascletá, an ear-splitting firework display. 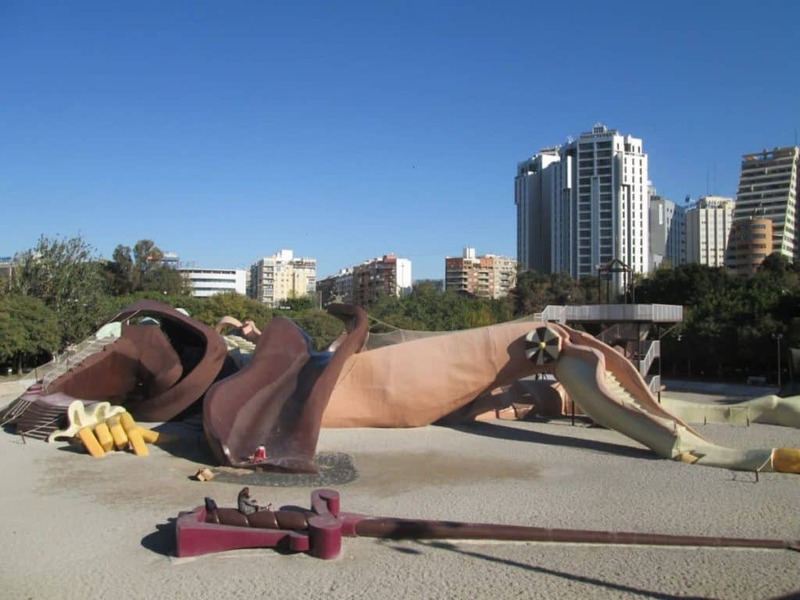 And throughout the week “Ninots”, huge cardboard sculptures with satirical themes, make their way around the city streets and are eventually burned in the Cremà, massive fires on the night of the 19th.